"Garcetti" redirects here. For his father, the former district attorney of Los Angeles County, see Gil Garcetti. For the U. S. Supreme Court case in which his father was lead complainant, see Garcetti v. Ceballos. Garcetti was born on February 4, 1971 at Good Samaritan Hospital  in Los Angeles and was raised in Encino,  in the San Fernando Valley. He is the son of Sukey (née Roth) and Gil Garcetti, a former Los Angeles County district attorney. Garcetti with his wife, Amy Elaine Wakeland, in June 2013. 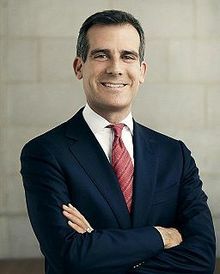 Garcetti endorsed Barack Obama in early spring 2007 and was the southern California chairman and one of six state co-chairs for the Obama campaign. He traveled to Iowa, Nevada and six other states, and was a frequent surrogate (in English and Spanish) for the campaign. He served as a superdelegate during the 2008 Democratic National Convention and was elected to serve as the Chair of Democratic Municipal Officials,  an organization affiliated with the Democratic National Committee that represents all local elected Democrats in the United States. From 2010 to 2012, then Councilor Garcetti appeared as "Ramon Quintero", the Mayor of Los Angeles, on the fictional TNT television show The Closer and its spin-off Major Crimes. His first appearance after becoming mayor was a 2016 episode of Major Crimes. His father, Gil Garcetti, is a consulting producer on both series. Garcetti also made a cameo appearance, as a desk security guard working in the mayor's office, in the pilot episode of the TBS series Angie Tribeca. ^ "LA mayor-elect Eric Garcetti at a glance". Associated Press. June 30, 2013. Retrieved August 16, 2018. ^ a b c d "Eric Garcetti Announces Run for L.A. Mayor". Eric Garcetti – Los Angeles Mayor 2013. September 8, 2011. Archived from the original on May 19, 2013. Retrieved October 20, 2013. A fourth-generation Angeleno, Garcetti was born at Good Samaritan Hospital and was raised in the San Fernando Valley. ... He also studied as a Rhodes Scholar at Oxford University and the London School of Economics and was a Rockefeller Foundation Next Generation Leadership Fellow. He taught public policy, diplomacy and world affairs at Occidental College and the University of Southern California before being elected to the City Council. ^ a b c d e Finnegan, Michael (January 2, 2013). "Eric Garcetti invokes Latino-Jewish ancestry in mayor's race". Los Angeles Times. Tribune Company. Archived from the original on August 3, 2013. Retrieved May 22, 2013. Eric's grandfather, Salvador Garcetti, was born in Mexico and grew up in Boyle Heights. Salvador was brought to the United States as a baby after his father, Massimo Garcetti, a judge who had emigrated from Italy, was hanged during the Mexican Revolution that began in 1910, Garcetti says. Eric's grandmother, Juanita Iberri, one of 19 children in a family that migrated from Sonora, Mexico, was born in Arizona. ... Garcetti's maternal grandfather, Harry Roth, turned the family's Los Angeles clothing business, Louis Roth & Co., into a major national brand of high-end suits for men. ... Garcetti, 41, was raised in Encino and attended a public elementary school at UCLA. From 7th to 12th grade, he went to Harvard, then a private boys' school in Studio City. ^ a b Weiner, Rex (October 7, 2011). "Jews and Latinos Seek Common Ground". The Jewish Daily Forward. New York City: Forward Association. Retrieved October 20, 2013. Garcetti is the product of an Italian-Mexican marriage on his paternal side, while his maternal Russian Jewish grandparents founded Louis Roth Clothing, the first union shop in L.A.'s garment industry. ^ a b Boyarsky, Bill (December 19, 2012). "Eric Garcetti: up close". The Jewish Journal of Greater Los Angeles. Retrieved October 20, 2013. His father, Gil Garcetti, the former district attorney, is of Mexican and Italian descent. His mother, the former Sukey Roth, is Jewish. ^ a b Medina, Jennifer (October 7, 2013). "Garcetti, New Los Angeles Mayor, Reflects Changing City". The New York Times. Retrieved October 20, 2013. His father, Gil Garcetti, who as district attorney in the 1990s prosecuted O. J. Simpson, is the son of Mexican immigrants who trace their roots to Italy. Mayor Garcetti's mother's family came from Russia in the early 20th century. ^ Weinraub, Anthony (March 8, 2017). "Eric Garcetti '88 wins second term as L.A. Mayor". The Chronicle. Retrieved October 16, 2018. ^ a b c d Columbia College (February 24, 2015). "Mayor Garcetti named speaker college class day 2015". Columbia College Today. Columbia College, Columbia University. Retrieved October 8, 2012. ^ "Rhodes Scholars Selected, and Half Are Women". The New York Times. 1992. ^ Jamison, Peter (July 28, 2016). "L.A. Mayor Eric Garcetti introduces himself to nation at DNC: 'I'm just your average Mexican American Jewish Italian'". latimes.com. Retrieved July 30, 2016. "I’m just your average Mexican-American Jewish Italian", Garcetti said. A Rhodes scholar who speaks fluent Spanish, he liberally sprinkled his address with Spanish phrases. ^ Ramos, George (February 20, 1995). "Prop. 187 Protest Has Sympathizers an Ocean Away". ^ Clark, Justin (April 2010). "Making Tinseltown Green". Columbia College Today. Retrieved November 24, 2018. ^ "Regeneration of War-Torn Societies". ^ a b "Eric Garcetti". Our Campaigns. Retrieved July 2, 2018. ^ "Our Team – Young Storytellers". Young Storytellers. Retrieved May 3, 2017. ^ McGreevey, Patrick; Fox, Sue (June 6, 2001). "Garcetti Defeats Woo". Los Angeles Times. ^ Verini, James (June 25, 2006). "Style & Culture; SMALL HOURS; Garcetti, walking the talk; Hollywood hardly shuts down after dark, and neither does the councilman who represents it. Clubs, plays, gallery openings -- he just likes getting out". ^ McGreevy, Patrick (November 22, 2005). "Quiet Transition Seen for Top Post on L.A. Council". Los Angeles Times. Archived from the original on October 22, 2012. ^ "After 100 Days in Office, LA Mayor Eric Garcetti Gets High Marks", Los Angeles Daily News, October 7, 2013 (via The Huffington Post). ^ Orlov, Rick (January 12, 2006). "A new course for city council on-time start gets garcetti plan going". Los Angeles Daily News. ^ "Taking Education in Los Angeles Personally", Los Angeles Times, April 11, 2013. ^ a b "Measure O: Clean Water, Ocean, River, Beach, Bay Storm Water Cleanup Measure". Smartvoter.org. Archived from the original on November 3, 2013. Retrieved May 22, 2013. ^ "Honorary Membership – Nomination Narrative" (PDF). American Society of Landscape Architects. Archived (PDF) from the original on June 30, 2018. Retrieved June 29, 2018. ^ Green, Emily (July 27, 2010). "Politics and water conservation". Los Angeles Times. Archived from the original on November 11, 2012. ^ "First Lady Michelle Obama Designates Los Angeles' Historic Filipinotown a Preserve America Community". BakitWhy. October 31, 2011. Archived from the original on July 30, 2012. Retrieved May 22, 2013. ^ Reitman, Valerie (April 12, 2007). "Palladium operator plans major renovation". Los Angeles Times. Archived from the original on November 13, 2012. ^ Davis, Genie (November 2, 2017). "The Hollywood Palladium: Historic Status for an Historic Venue". Only in Hollywood. Retrieved November 24, 2018. ^ "Commission Takes a Dive for Garcetti" Archived April 2, 2015, at the Wayback Machine, citywatchla.com, October 7, 2014. ^ "Silver Lake demolition takes city and neighborhood leaders by surprise". The Eastsider LA. Archived from the original on April 7, 2013. Retrieved May 22, 2013. ^ Almeida, Christina (May 31, 2006). "After years of decline, Hollywood is LA's hot new address". The Boston Globe. Archived from the original on October 25, 2012. ^ Willon, Phil (March 5, 2010). "L.A. City Council eases business tax to keep Internet firms from bolting". Los Angeles Times. Archived from the original on March 8, 2010. ^ "L.A. Now". Los Angeles Times. September 8, 2011. Archived from the original on September 8, 2011. ^ Jones, Barbara (January 30, 2013). "Teachers union backs Eric Garcetti". Los Angeles Daily News. Archived from the original on August 8, 2014. ^ Mehta, Seema; Nelson, Laura J. (May 22, 2013). "Garcetti wins race for L.A. mayor; Greuel concedes". Los Angeles Times. Tribune Company. Archived from the original on May 22, 2013. Retrieved May 22, 2013. Garcetti will be the first elected Jewish mayor of the city. At 42, he will also be the youngest in more than a century. ^ Saillant, Catherine (May 22, 2013). "Antonio Villaraigosa congratulates Mayor-elect Eric Garcetti". Los Angeles Times. Archived from the original on May 23, 2013. ^ "A 20% turnout in L.A.'s mayoral election wasn't a record low after all, final results show". Los Angeles Times. Retrieved 2017-11-11. ^ O'Brien, Brendan (March 8, 2017). "Los Angeles mayor wins re-election in landslide". Reuters. Archived from the original on March 10, 2017. Retrieved March 10, 2017. ^ a b Reston, Maeve (April 21, 2018). "Why LA's Mexican-American-Jewish-Italian mayor is spending time in Iowa and South Carolina". CNN. Retrieved December 13, 2018. ^ Nazaryan, Alexander (January 5, 2018). "Let's compare Eric Garcetti and Bill de Blasio". Los Angeles Times. Retrieved December 13, 2018. ^ Buntin, John (August 2014). "Does Eric Garcetti Have a Big Enough Vision for L.A.?". Governing. Retrieved December 13, 2018. ^ Chasmar, Jessica (December 11, 2018). "Los Angeles Democratic mayor shut down by socialists at USC". The Washington Times. Retrieved December 13, 2018. ^ Whitley, Jared (April 18, 2018). "Garcetti 2020? Are You Kidding?". The Weekly Standard. Retrieved December 13, 2018. ^ Siders, David (May 17, 2018). "Garcetti taps Hollywood ties to fuel 2020 campaign". Politico. Retrieved December 13, 2018. ^ Maddaus, Gene (May 14, 2014). "Eric Garcetti's First Budget Shows That Changes Come Slowly to L.A. City Hall". LA Weekly. Archived from the original on May 15, 2014. ^ a b c "Eric Garcetti's 'Back to Basics' budget offers modest service upgrades". Los Angeles Times. April 14, 2014. Archived from the original on April 17, 2014. ^ Orlov, Rick (August 5, 2014). "L.A. Mayor Eric Garcetti begins performance reviews of city general managers". Los Angeles Daily News. Archived from the original on September 23, 2015. ^ Lopez, Andrew (April 14, 2014). "Los Angeles Mayor Eric Garcetti Unveils Budget Proposal". NBC Southern California. Archived from the original on May 5, 2014. ^ "Mayor Eric Garcetti to Bring on Two Entrepreneurs in Residence". westsidetoday.com. May 3, 2014. Archived from the original on May 3, 2014. ^ Orlov, Rick (May 2, 2014). "City of Los Angeles now has 'entrepreneurs in residence'". Los Angeles Daily News. Archived from the original on May 3, 2014. ^ Mason, Melanie (June 5, 2014). "In Sacramento, L.A. Mayor Eric Garcetti talks water, film tax credit". Los Angeles Times. Archived from the original on October 6, 2012. ^ Megerian, Chris (August 13, 2014). "Garcetti sees progress on film tax credit negotiations". Los Angeles Times. Archived from the original on October 6, 2012. ^ Rainey, James (September 1, 2014). "Garcetti calls for boosting minimum wage to $13.25 after three years". Los Angeles Times. Archived from the original on October 6, 2012. ^ "Garcetti calls for $13.25 minimum wage by 2017". Los Angeles Times. September 1, 2014. Archived from the original on October 6, 2012. ^ Smith, Dakota (September 19, 2014). "Mayor Eric Garcetti: Raising Los Angeles minimum wage is part of 'an American movement'". Daily News. Archived from the original on September 21, 2014. ^ Los Angeles mayor officially names Women's Entrepreneurship Day a celebration in LA!. Womens Entrepreneurship Day WED. YouTube. February 2, 2018. Retrieved October 16, 2018. ^ "Our Story". Women's Entrepreneurship Day. ^ Orlov, Rick (July 7, 2014). "Garcetti: Los Angeles to reject federal government's requests to detain immigrants". Los Angeles Daily News. Archived from the original on July 11, 2014. ^ Reyes, Emily Albert (July 15, 2014). "L.A. to help shelter detained immigrant children, Mayor Garcetti says". Los Angeles Times. Archived from the original on October 6, 2012. ^ "L.A. Legal Fund Aims to Help Immigrants Facing Deportation, Draws Criticism Over Who Deserves Representation". KTLA. Los Angeles Times. April 17, 2017. Retrieved June 9, 2018. ^ "Los Angeles Mayor Struggling to Expand the Number of Female Firefighters". www.fireengineering.com. ^ Lopez, Robert J.; Welsh, Ben (March 20, 2014). "Eric Garcetti scraps LAFD hiring process, says it's 'fatally flawed'". Los Angeles Times. Archived from the original on March 27, 2014. ^ "Mayor Eric Garcetti Halts Flawed LA Fire Dept. Recruiting". FOX 5. March 21, 2014. Archived from the original on April 13, 2014. ^ "Mayor Eric Garcetti Suspends LA Fire Department Recruit Program". KTLA. March 21, 2014. Archived from the original on April 13, 2014. ^ DeSocio, Jeffery Thomas. "Mayor Eric Garcetti Halts Flawed LA Fire Dept. Recruiting". myFOXla.com. Archived from the original on March 23, 2014. ^ "L.A. Fire Department Halts Recruitment, Cancels Academy". City News Service. March 20, 2014. Archived from the original on July 23, 2014. ^ "LA 2024 brings large crew to Rio Olympics". Los Angeles Times. July 2016. Archived from the original on 31 July 2016. Retrieved 31 July 2016. ^ "LA Committee Lobbies For 2024 Olympics In Qatar". Archived from the original on 23 December 2016. Retrieved 18 May 2017. ^ Wharton, David. "Los Angeles makes deal to host 2028 Summer Olympics". Los Angeles Times. Retrieved 31 July 2017. ^ Sharp, Steven (November 27, 2018). "Here are the 28 Projects that Metro Could Complete Before the 2028 Olympics". Urbanize. Retrieved July 2, 2018. ^ "Mayor Garcetti names Nina Hachigian Deputy Mayor for International Affairs". Office of Los Angeles Mayor Eric Garcetti. 2017-08-04. Retrieved 2018-01-23. ^ Orlov, Rick (July 22, 2014). "Union objects to L.A. Mayor Eric Garcetti, police discussing contract". Los Angeles Daily News. Archived from the original on July 26, 2014. ^ Walton, Alice (July 24, 2014). "Mayor Garcetti turns to YouTube to communicate directly with LAPD officers about contract (updated)". 89.3 KPCC. Archived from the original on August 8, 2014. ^ Roderick, Kevin (July 24, 2014). "Mayor's video takes his message directly to LAPD officers". LA Observed. Archived from the original on July 25, 2014. ^ Saillant, Catherine (July 24, 2014). "Garcetti uses YouTube to appeal to LAPD officers on contract offer". Los Angeles Times. Archived from the original on October 6, 2012. ^ "L.A. will buy 7,000 body cameras for police officers". Los Angeles Times. Tribune Publishing. December 16, 2014. Retrieved December 18, 2014. ^ Jamison, Peter; Alpert Reyes, Emily (2015-04-14). 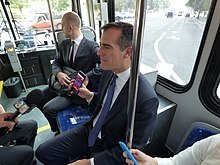 "State of City: Garcetti focuses on public safety; wants Uber, Lyft at airport". Los Angeles Times. Retrieved 2016-04-29. ^ Zahniser, David (September 11, 2013). "L.A. City Council confirms Mayor Eric Garcetti's DWP commissioners". Los Angeles Times. Archived from the original on April 26, 2014. ^ Zahniser, David (August 16, 2013). "Mayor Garcetti moves to 'shake up' DWP with four new board members". Los Angeles Times. Archived from the original on April 29, 2014. ^ a b Orlov, Rick (August 22, 2013). "L.A. Mayor Eric Garcetti embraces DWP contract". Los Angeles Daily News. Archived from the original on April 7, 2014. ^ Zahniser, David; Saillant, Catherine (August 22, 2013). "DWP deal is a mixed win for Eric Garcetti in his 1st duel with labor". Los Angeles Times. Archived from the original on April 7, 2014. ^ Maddaus, Gene (August 22, 2013). "Mayor Eric Garcetti Trumpets Victory on New Contract With DWP Workers". LA Weekly. Archived from the original on July 14, 2014. ^ "ERIC GARCETTI NOMINATES MARCIE EDWARDS TO HEAD LADWP". abc7.com. January 30, 2014. Archived from the original on May 18, 2014. ^ "Los Angeles City Council Unanimously Confirms Marcie Edwards as LADWP General Manager". LADWP. February 21, 2014. ^ Lovett, Ian (July 16, 2013). "Call for Calm as Los Angeles Girds for More Unrest". New York Times. ^ "Kareem Abdul-Jabbar, Los Angeles Mayor Eric Garcetti pleased with NBA's lifetime ban on Donald Sterling". Los Angeles Daily News. April 29, 2014. Archived from the original on May 3, 2014. ^ "Sterling furor presents test of L.A. Mayor Eric Garcetti's leadership". Los Angeles Times. April 30, 2014. Archived from the original on October 6, 2012. ^ "L.A. Mayor Eric Garcetti Foresees Lengthy Battle With Donald Sterling". Reuters. May 4, 2014. Archived from the original on May 5, 2014. ^ "Donald Sterling will fight to keep Clippers, Garcetti predicts". Los Angeles Times. May 4, 2014. Archived from the original on May 5, 2014. ^ Smith, Dakota (May 4, 2014). "Los Angeles Mayor Eric Garcetti believes Donald Sterling will fight Clippers sale". Los Angeles Daily News. Archived from the original on May 7, 2014. ^ Smith, Dakota (May 9, 2014). "Mayor Eric Garcetti opposes Shelly Sterling's continued Clippers ownership". Pasadena Star-News. Archived from the original on May 12, 2014. ^ "Officer accused of racial slur deserved more punishment, Garcetti says". Los Angeles Times. May 9, 2014. Archived from the original on February 24, 2017. ^ Lovett, Ian (July 12, 2013). "Where Car Is King, Smartphones May Cut Traffic". New York Times. Archived from the original on November 2, 2017. ^ Hawthorne, Christopher (December 6, 2014) "'LATINO URBANISM' INFLUENCES A LOS ANGELES IN FLUX" Archived 2014-12-08 at the Wayback Machine Los Angeles Times; accessed December 8, 2017. ^ Orlov, Rick (April 15, 2014). "Eric Garcetti signs waste franchise plan to expand recycling". Los Angeles Daily News. Archived from the original on May 6, 2014. ^ "Mayors National Climate Action Agenda". Mayors National Climate Action Agenda. Archived from the original on 2017-04-20. ^ Climate Mayors (June 1, 2017). "#ClimateMayors adopt, honor and uphold #ParisAgreement goals". Medium. Archived from the original on June 2, 2017. ^ "Mayor Launches L.A.'S First-Ever Sustainable City Plan". lamayor.org. Archived from the original on April 12, 2015. Retrieved April 9, 2015. ^ "Mayor Launches 'First-Ever' Sustainability Plan For LA Economy, Environment". CBS Local. Archived from the original on April 11, 2015. Retrieved April 9, 2015. ^ Lin II, Rong-Gong; Xia, Rosanna (January 14, 2014). "L.A. Mayor Garcetti calls for aggressive earthquake safety effort". Los Angeles Times. Archived from the original on April 13, 2014. ^ Zahniser, David (June 20, 2014). "Garcetti picks San Francisco official for L.A. transportation agency". Los Angeles Times. Archived from the original on October 6, 2012. ^ Orlov, Rick (September 29, 2014). "Making Los Angeles streets 'great,' ending pedestrian deaths are Mayor Eric Garcetti and LADOT's goals". Los Angeles Daily News. Retrieved September 20, 2015. ^ "Great Streets for Los Angeles | Bus". Scribd.com. Retrieved December 22, 2016. ^ Nagourney, Adam (September 23, 2015). "Frank Gehry Draws Ire for Joining Los Angeles River Restoration Project". The New York Times. ISSN 0362-4331. Retrieved August 23, 2017. ^ "Frank Gehry's controversial L.A. River plan gets cautious, low-key rollout". Los Angeles Times. June 18, 2016. ISSN 0458-3035. Retrieved August 23, 2017. ^ "Frank Gehry revealed as designer of masterplan for LA River". Dezeen. August 10, 2015. Retrieved August 23, 2017. ^ "River LA to hold first public listening session today in South Gate". Los Angeles Times. May 14, 2016. ISSN 0458-3035. Retrieved August 23, 2017. ^ Morrison, Patt. "Can Frank Gehry and a coalition of advocates bring the L.A. River back to life?". Los Angeles Times. ISSN 0458-3035. Retrieved August 23, 2017. ^ Aron, Hillel (January 14, 2017). "Anti-Development Ballot Measure Befuddles Candidates". LA Weekly. Retrieved April 7, 2017. ^ "Los Angeles County Election Results". Los Angeles County Clerk's Office. March 7, 2017. Retrieved March 23, 2017. ^ "Mayor Eric Garcetti calls Los Angeles VA wait times 'unacceptable'". Los Angeles Daily News. June 9, 2014. Archived from the original on June 12, 2014. ^ Karlamangla, Soumya (June 9, 2014). "Garcetti promises 10,000 jobs for veterans by 2017". Los Angeles Times. Archived from the original on October 6, 2012. ^ Holland, Gale (July 16, 2014). "Mayor Eric Garcetti pledges to end veteran homelessness in 2015". Los Angeles Times. Archived from the original on October 6, 2012. ^ Holland, Gale (July 11, 2014). "Michelle Obama scheduled to speak at L.A. summit on homeless veterans". Los Angeles Times. Archived from the original on October 6, 2012. ^ "First Lady Michelle Obama to Speak in Los Angeles". NewsRadio KFBK. July 16, 2014. Archived from the original on August 8, 2014. ^ Gazzar, Brenda (July 16, 2014). "First Lady Michelle Obama tells L.A. leaders that homeless vets should 'horrify all of us'". Los Angeles Daily News. Archived from the original on July 27, 2014. ^ "First lady speaks out for veterans and teachers". Los Angeles Wave. July 17, 2014. Archived from the original on August 5, 2014. ^ Malkin, Michelle (July 18, 2014). "Michelle Obama's Veterans Affairs scandal distraction". Washington Examiner. Archived from the original on July 26, 2014. ^ Fine, Howard (August 30, 2017). "L.A. Businesses Hire 10,500 Veterans, Beating Mayor Eric Garcetti's Goal". Los Angeles Business Journal. Retrieved December 28, 2018. ^ a b Chiland, Elijah (July 23, 2018). "Ballot measure to help homeless in LA may fall short of its goal". Curbed Los Angeles. Retrieved December 28, 2018. ^ Finnegan, Michael (February 9, 2017). "'He's pretty darn lucky.' Garcetti's riding the wave of L.A's. 'renaissance' as he runs for reelection". Los Angeles Times. Archived from the original on February 10, 2017. Retrieved February 10, 2017. ^ Smith, Doug (October 20, 2016). "A fix for L.A.'s homeless crisis isn't cheap. Will voters go for $1.2 billion in borrowing". Los Angeles Times. Archived from the original on February 11, 2017. Retrieved February 10, 2017. ^ Tata, Samantha (January 14, 2014). "LA Mayor Garcetti Was Passenger in Police Car That Struck Pedestrian". NBC Southern California. Archived from the original on January 16, 2014. ^ Finnegan, Michael; Zahniser, David (January 14, 2014). ".A. Mayor Garcetti's vehicle hits woman crossing street". Los Angeles Times. Archived from the original on April 6, 2014. ^ Kandel, Jason (January 15, 2014). "LA Mayor Garcetti Visits Woman in Hospital After Crash". NBC Southern California. Archived from the original on September 28, 2014. ^ Zahniser, David; Alpert Reyes, Emily; Branson-Potts, Hailey (June 16, 2014). "Garcetti drops an F-bomb at Kings celebration – and there's fallout". Los Angeles Times. Archived from the original on June 17, 2014. Retrieved June 18, 2014. ^ Finnegan, Michael (June 17, 2014). "To any offended by his Kings' party F-bomb, Garcetti says lighten up". Archived from the original on October 6, 2012. ^ "CBS2 Investigates L.A. Mayor's Campaign Donations Tied To Landscaping Company". Archived from the original on October 12, 2016. Retrieved October 12, 2016. ^ "There's a Grass Warfare Going On in L.A." Bloomberg.com. Archived from the original on October 12, 2016. Retrieved October 12, 2016. ^ "Democratic Municipal Officials". Thedmo.org. Archived from the original on July 28, 2011. Retrieved May 22, 2013. ^ Smith, Dakota (April 3, 2014). "President Bill Clinton, Mayor Eric Garcetti talk environmental issues". Los Angeles Daily News. Archived from the original on April 7, 2014. ^ Shuman, Phil (April 3, 2014). "Bill Clinton and Eric Garcetti Take Us into The Future at City Hall". FOX 11 LA KTTV. Archived from the original on April 7, 2014. ^ "L.A. Mayor Eric Garcetti's endorsement of Hillary Clinton hits embarrassing snag". Los Angeles Times. November 6, 2015. Archived from the original on November 6, 2015. ^ Edwards, Chelsea (February 13, 2017). "Calexit supporters hold forum in LA as effort to collect ballot signatures continues". KABC. Archived from the original on November 7, 2017. Retrieved June 29, 2018. ^ "2020 watch: LA Mayor Eric Garcetti to visit Iowa in April". Des Moines Register. Retrieved April 1, 2018. ^ Leclerc, Cherise (May 13, 2018). "Rumored 2020 contender L.A. Mayor Eric Garcetti speaks at SNHU graduation". WMUR. Archived from the original on May 14, 2018. Retrieved May 15, 2018. ^ Daniels, Jeff (January 29, 2019). "LA Mayor Eric Garcetti ends months of speculation, decides against 2020 Democratic presidential run". CNBC. Retrieved 30 January 2019. ^ Arango, Tim (January 29, 2019). "L.A. Mayor Eric Garcetti Decides Against Presidential Bid". New York Times. Retrieved 30 January 2019. ^ Smith, Dakota; Finnegan, Michael (January 29, 2019). "Los Angeles Mayor Eric Garcetti skips presidential race to 'finish the job' at home". Los Angeles Times. Retrieved 30 January 2019. ^ " Saudi Arabia's Crown Prince Mohammed bin Salman toured Hollywood, Harvard and Silicon Valley on US visit Archived 2018-05-23 at the Wayback Machine". The Independent. April 7, 2018. ^ Eng, Joyce (March 4, 2016). "Exclusive Major Crimes Sneak Peek: Look Who's Marrying Provenza and Patrice". TV Guide. Archived from the original on June 17, 2016. Retrieved June 16, 2016. ^ "Jay Z, Mayor Garcetti Announce Summer L.A. Music Festival". KTLA 5. April 16, 2014. Archived from the original on April 29, 2014. ^ Pedersen, Erik (January 28, 2016). "[WATCH] 101 Freeway Closure: LA Mayor Eric Garcetti Slow-Jams Reminder". Deadline. Archived from the original on February 6, 2016. Retrieved February 6, 2016. ^ #101SlowJam. Eric Garcetti. YouTube. February 4, 2016. Retrieved October 16, 2018. ^ "James Corden Jokes About Drought, Cuts Ribbons as He Plays L.A. Mayor for Day". The Hollywood Reporter. Retrieved January 3, 2017. ^ "Who Will Be L.A.'s Next Mayor? AirTalk's 2013 Live Mayoral Debate (video)". 89.3 KPCC. February 6, 2013. Retrieved October 5, 2018. ^ Rainey, James; Finnegan, Michael (April 4, 2013). "Garcetti has a side commitment: the U.S. Naval Reserve". Articles.latimes.com. Archived from the original on April 22, 2013. Retrieved May 22, 2013. ^ Saillant, Catherine (August 20, 2013). "Mayor Garcetti to end his Naval Reserve active duty this year". Los Angeles Times. Archived from the original on June 28, 2018. Retrieved June 28, 2018. ^ Behrens, Zach (January 6, 2009). "Eric Garcetti Gets Married, Young Women Depressed Across LA". LAist. Retrieved October 22, 2018. ^ The Jewish Journal: "Eric Garcetti: up close" By Bill Boyarsky Archived 2013-10-26 at the Wayback Machine December 19, 2012 | "Garcetti's wife, whom he met at Oxford when they were Rhodes scholars, is not Jewish"
^ Reston, Maeve (May 10, 2013). "Eric Garcetti woos female voters; says campaign will finish strong". Los Angeles Times. Articles.latimes.com. Archived from the original on May 18, 2013. Retrieved May 22, 2013. ^ a b Finnegan, Michael; Rainey, James (May 25, 2013). "The mayor-elect's partner in life". Los Angeles Times. Archived from the original on June 16, 2016. Retrieved June 16, 2016. ^ Powers, John (17 April 2017). "Los Angeles Mayor Eric Garcetti on Immigrants, Angels Flight, & More". Vogue. Retrieved 31 October 2017. ^ Weiner, Rex (July 3, 2012). "Eric Garcetti Embodies L.A. Melting Pot". The Jewish Daily Forward. New York City: Forward Association. Archived from the original on November 3, 2013. Retrieved October 20, 2013. ^ Boyarsky, Bill (December 19, 2012). "Eric Garcetti: up close". Jewish Journal. Archived from the original on October 26, 2013. ^ Belgum, Deborah (February 11, 1997). "D.A. 's Daughter Makes Own Way". Los Angeles Times. ^ "Deputy District Attorney Turned Acupuncturist - December 2008". Acupuncture.com. Retrieved 2016-03-07. ^ "Past Millennium Award Recipients". Global Green. Retrieved July 26, 2018. ^ "Eric Garcetti 2006". John F. Kennedy Presidential Library and Museum. Retrieved July 26, 2018. ^ Orlov, Rick (May 16, 2014). "Los Angeles Mayor Eric Garcetti honored by NAACP as a Person of the Year". Los Angeles Daily News. Archived from the original on May 17, 2014.